Home » Blog » Dental implants » Beautiful or Healthy Dental Implants? How About Both! Beautiful or Healthy Dental Implants? How About Both! It wasn’t long ago that if you lost a tooth, your only options were dentures or a bridge. That was it. Dentures were awkward, uncomfortable, and didn’t look or function all that well. Bridges were expensive, hard to clean, broke, and didn’t look all that great. Then came dental implants. Titanium dental implants. They were small screws that were placed in the bone that you could put a tooth onto later. No bridge. No removable dentures. They looked and functioned much like a normal tooth. Most of the time. Unfortunately, they had a host of problems in and of themselves. Titanium can corrode over time in an acidic environment. Especially if it is near a dissimilar metal. Sound like a familiar environment? That’s exactly what most people’s mouths are like. They are highly acidic and often have other metals in them – like mercury amalgam fillings, for example. At first no one realized the implants were corroding at all. You would only notice if the patient had symptoms and the implant was removed. But most patients never know their implant is oxidizing and corroding, they just slowly let the leached toxins into the body, unaware of any issues. So most doctors never knew their implants could be a potential health risk. The other purported benefit of titanium dental implants is that they look like a natural tooth. But natural teeth don’t have rapidly receding gums (in the absence of periodontal disease) and those receding gums don’t leave unsightly gray lines in your mouth. Still, titanium implants were better than bridges and removable dentures, so doctors flocked to them and patients loved the new “miracle teeth” they could get to replace their old appliances. Now, however, there is a new option. White, ceramic, zirconia dental implants. They aren’t new, per se, but they are “newer” on the market. First approved in the United States by the FDA in 2007, Z-Systems Zirkolith dental implants have been placed internationally for more than 12 years. More than 27,000 of their implants have been placed. Studies have been done and tests have been run. And the results are very, very positive. For the first time, patients have a truly healthy, cosmetically beautiful option for replacing teeth. Zirconia dental implants are white, just like teeth and bone. They also encourage soft tissue growth. What does that mean for you, the patient? It means that you are far less likely to have your gums recede around your ceramic dental implant than a metal one, and even if they do recede, it won’t be noticeable because the implants are white, just like your teeth. But these implants aren’t just a beautiful option. Zirconia is derived from Zirconium, a metal. During the manufacturing process, all of the metals are removed before it becomes Zirconia (Zirconia is what our Z-Systems Zirkolith Implants are made from). Because they are ceramic implants, not metal, they don’t have the oxidizing and corroding issues that are sometimes associated with titanium dental implants. That means for you, the patient, a healthier option. At Marilyn K. Jones, DDS we do everything we can to provide beautiful AND healthy dentistry. Biological dentistry is all about treating each patient as an individual and treating the mouth as an integral part of your body and overall health. No “one size fits all” dentistry and no “dental school told me mercury was okay so I’ll keep right on placing it.” Not at our practice in Houston. That’s one of the reasons we place Z-Systems dental implants. 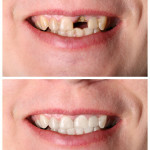 Are they the perfect option for every one of our Houston dental patients? Absolutely not. But are they a healthy, beautiful alternative to tooth replacement that many of our patients should consider? Definitely. So if you have a missing tooth, a bridge, a denture, or even a titanium dental implant, give our office a call. You might have better options available to you, and we can help you get the beautiful, healthy smile you deserve. This is Kim Walker. I saw you many years ago and had a biocalex root canal on a front tooth and it seems to be fine. Currently I have what looks like infection or inflamation on molar 18 that is cracked. I am investigating options. My local dentist is recommending root canal however I see you use zircolith implants. What is the investment in a zircolith implant? Please call the office and let the front staff know you have questions regarding cost and options, if they don’t have the answers you need they will get it or one of the team will get right back to you! Thank You!